This lesson explains you about cells, batteries and circuits. 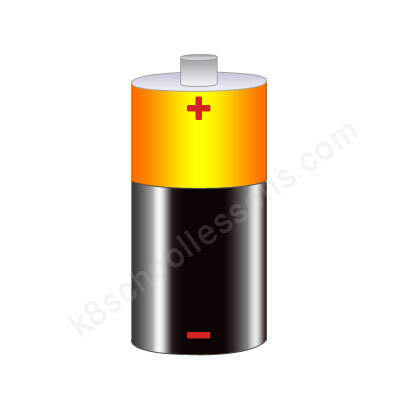 A battery is a device that makes and stores electricity. What is the proper name for a single battery? What is an electrical cell? An electrical cell is used to make electricity. What does the word ‘battery’ really mean? Two or more cells joined together. If a number of cells are joined together, they make a battery. Who invented the first electric battery (cell)? An Italian *physicist called Alessandro Volta. When was the first electric battery invented? There are chemicals in a battery. When the cell or battery is joined up in a complete circuit, chemical energy in the battery turns into electrical energy and produces an electric current (electricity). Why does the cell or battery provide an electrical force? To push electricity around the circuit. What is an electrical force? An electrical force is an electrical power or strength. Volt is the unit used to measure electrical force. The unit has been named after Alessandro Volta (1745-1827). Voltage is the electrical force produced in a cell or battery, measured in volts. What is the voltage of an electrical cell? A circuit is a path which an electric current takes around a loop of wires and connections. What are the features of a circuit? 1) A circuit is a loop with no beginning and no end. 2) Electricity moves or flows around the whole circuit. 3) Electricity flows through the wires, the bulb, the switch and the cell. How do you know that the electricity flows around the circuit? When electricity flows around the circuit it makes the light bulb glow. What does the cell in a circuit do? Why does the circuit need the energy stored in the cell? Energy from the cell is needed to make electricity flow around the circuit. Energy stored in the cell is changed to heat and light in the bulb. What do you use to turn an electric light on or off? A switch is a way of opening and closing a gap in a circuit. Switches are easier and safer than touching two wires together or pulling them apart. When does the electricity flow through the bulb? Electricity flows through the bulb only when the switch is ‘on’ and the gap in the circuit is closed. When cannot the electricity flow? When the switch is off and there is a gap in the circuit.